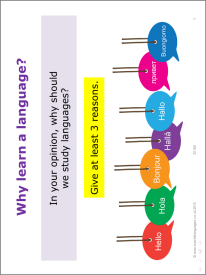 A series of activities designed to challenge some myths about learning a language and encourage year 7 or 8 students to see the value of their MFL studies. Teaching notes, answers and an interactive sequencing task provided. Thanks so much. The material is worth it. Merci. Tout à fait intéressant.